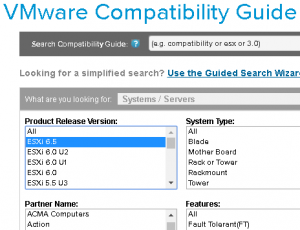 Double check your vendor support when updating ESXi hosts from to vSphere 6.7. Some systems have not been certified by their vendor yet. The following servers were supported in vSphere 6.5 but are according to VMware's HCL not yet supported in vSphere 6.7. Your server is listed and you want to upgrade? 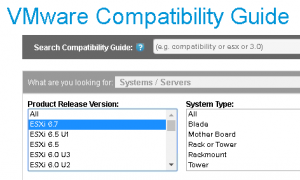 Vendor support matrices sometimes differ from VMware HCL. Please ask your vendor or VMware whether you are allowed to upgrade. The list has been created with the help of my HCL in JSON Format. Follow the comments to get notified of updates. 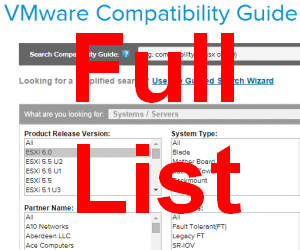 Double check your vendor support when updating ESXi hosts from VMware vSphere 6.0 to 6.5. Some systems have not been certified by their vendor yet. The following servers were supported in vSphere 6.0 but are according to VMwares HCL not yet supported in vSphere 6.5. Follow the comments to get notified about updates. It's on my to-do list for quite a long time: Create a Script that checks hardware against VMwares HCL. There are some problems that needs to be solved to automate the process. My main problems are matching the installed ESXi version to the release Level (eg. 5.5 U2, 6.0, 6.0 U1,...), integrating the HCL into a script and matching HCL to the physical hardware. I need a larger pool of hardware information to know how hardware identifies itself. So if you want to support me, please run the following PowerCLI command and send me the output (Just Copy/Paste CSV file contents to my Contact Form, or send me an eMail. I will respond with the output of my script as shown above). If you don't want to disclose your hostnames, just remove the "Name" part in the command, or replace the content with dummy-names. 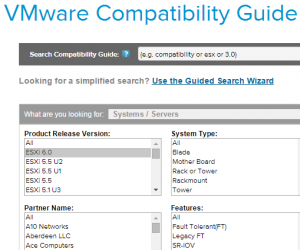 To extend my homelab I was searching for a cheap homeserver hardware that was listed in the Compatibility Guide by VMware. My target was that the system must be supported with ESXi 5.5. There were 3 systems that are in the market since about 5 years and sold as refurbished systems and one system from Lenovo that has a brand-new Haswell CPU.